oh it always seems as payday becomes closer my eye seems to do more wandering when looking online. i mean if anyone wants to take it amongst themselves to buy me any of them i won't complain, haha. 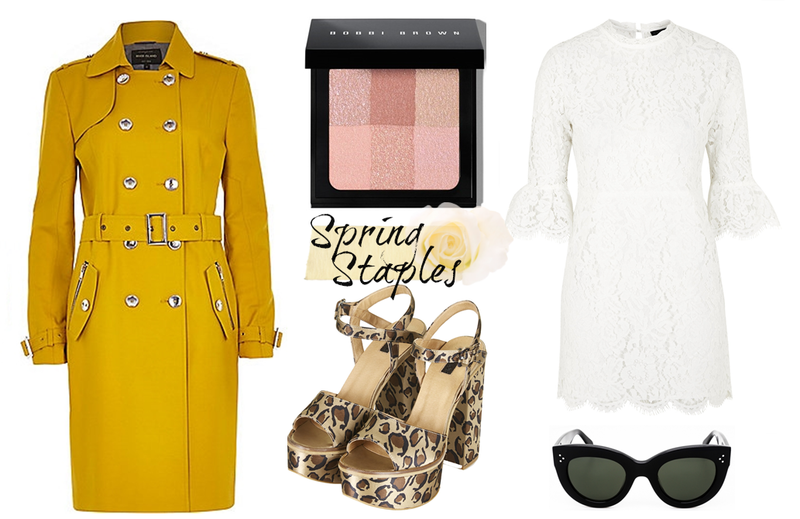 the trench coat and the dress are going to be absolutely stunning in the summer time; a pop of colour i think is just what you need when transitioning from winter into spring. and the feminine touch of lace on the sleeves is just the piece de resistance for that ultimate spring chic look. also it's almost time where sunglasses are acceptable anytime, any day. and i can't wait for it as i have some new alexander mcqueen sunglasses to show you! plus the black classic celine shades above are a total staple in my eyes. sunglasses are always something i feel are worth investing a little more into, as they'll never go out of style. also make up can start going a little more dewy and lighter now and this bobbi brown blush palette looks great to add a hint of colour to your cheeks. i know i haven't added loads to my latest wishlist but it's safe to say i want them all. what do you think? That trench coat is such a lovely colour and I love that lace dress! Such a cute list ! Love the shoes and sunnies ! Love yellow in Spring. I just invested in a Joules yellow fishermans jacket but that mac is really tempting me too! I wish I hadn't seen this now *waaaa*!! I did already fall in love with the white Topshop dress but now those heels and trench are just calling me and the Bobbi palette! Oh lordy, you huge influencer you ;)!